As a builder or remodeler, your choice of flooring materials must satisfy your customers as well as your project budget. And if you're fixing up a property as a rental investment, the flooring must be suitable for significant wear and tear. Some flooring choices are no-brainers: tile in bathrooms, for instance. Others are subject to the home's style and value and to the preferences of the local market. If you're building or prepping homes for sale, it makes sense to talk to local realtors to get a sense of what home buyers are looking for in the area. In any case, the price, quality, and style of flooring should be appropriate for the interior decor and value of the house. It's hard to go wrong with attractive tile flooring. Tile has long been the best option for bathrooms, but home buyers also love it in everyday dining areas, kitchens, hallways, entryways, mudrooms, and laundry rooms. In terms of color and overall style options, tile is by far the most versatile flooring material available. There's everything from tiny mosaics to large format floor tiles to "wood look" tile that blends the look of hardwood with the durability of ceramic. Porcelain and glazed ceramic tile are the most durable flooring options, and they require very little maintenance. Grout on floor tiles should be sealed periodically to prevent staining. This is particularly important for rental properties that you will maintain. Tile doesn't have to be expensive, but it is labor-intensive to install and requires a suitable subfloor and a cementboard or tile backer base. 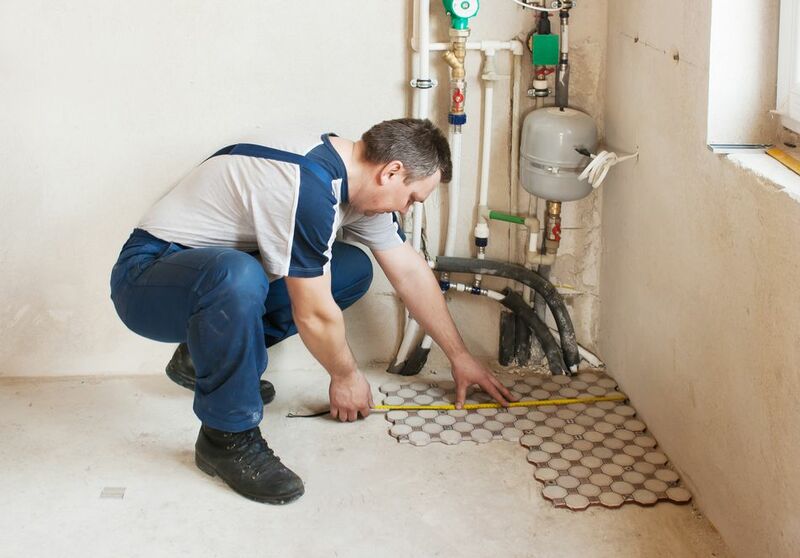 Large or tricky tile jobs are best left to a tile installer. Small and simple jobs can be done by most builders with some tile experience. Because tile is hard and can be cold underfoot, be careful about using it in living areas, such as living rooms, bedrooms, family rooms, and formal dining rooms. However, in some markets, tile is just right for these locations. Also be careful when choosing tile for wet areas like bathrooms, entryways, and mudrooms; these must have non-slip tile for safety. Hardwood is arguably the best looking flooring type out there and is a perennial favorite with home buyers and renters alike. Hardwood makes sense for almost any living area and, in some cases, kitchens and dining rooms. Hardwood is not a good choice for any room that frequently gets wet or sees a lot of traffic, including bathrooms, laundry rooms, and mudrooms. Bamboo flooring is similar to hardwood in performance, cost, installation, and maintenance. Today's hardwood flooring comes both unfinished and prefinished and in solid and engineered forms. Solid hardwood is 3/4-inch-thick, tongue-and-groove planks that are usually nailed to a wood subfloor but can be glued to concrete. Unfinished solid hardwood is sanded and finished on site after the flooring is installed. Prefinished hardwood needs no site finishing. Engineered hardwood flooring is a plywood-like material with a solid-hardwood top layer. Conventional types can be nailed or glued down. There are also click-together engineered hardwood planks for "floating floor" installation. Hardwood goes down pretty quickly and can be installed by most builders, although glue-down installation is more tricky than nail-down. Engineered floating floor installation is the easiest and fastest option. Note that solid hardwood should not be using in sub-grade basements, due to moisture concerns. Some manufacturers of engineered hardwood guarantee their flooring for basements. The main drawbacks of hardwood are cost and maintenance. All hardwood must be finished, usually with polyurethane or a similar clear-coat. The finishes offer moderate moisture-resistance and are prone to scratching and excessive wear if the floor isn't kept clean. For these reasons, hardwood is not a good option for many rental properties. Laminate flooring essentially is a low-cost alternative to hardwood. It's made of wood pulp and resin and can look a lot like real wood, but discerning buyers can tell the difference. Laminate can mimic almost any hardwood style, from traditional favorites like maple and cherry to specialty types like wide-plank pine and reclaimed barn wood. Laminate flooring is made with an MDF (medium density fiberboard) core topped with a photo layer (for looks) and a thick polymer finish. Almost all types are designed for click-together floating-floor installation, which is quick and easy. Laminate can also be glued down, but this is rarely necessary or recommended. Unlike hardwood, laminate flooring cannot be refinished if the finish wears or is damaged, and laminate is impossible to repair. Its finish is tough and highly moisture- and stain-resistant, but the joints between planks are vulnerable to moisture and will swell and chip if water is allowed to sit on the floor. Overall, laminate is a great option for a hardwood look in living areas (not bathrooms) in low- to mid-price properties. Carpet needs no introduction or explanation. It is an attractive option for many builders because it comes in so many colors and styles, it installs quickly, and it looks great when it's new. Carpet is also warm, soft, and quiet, which is why it's preferred by many homeowners for bedrooms and living and family rooms. Carpet's quiet also makes it a great choice for upper-level rooms in multistory homes. Capet should never be used in bathrooms or kitchens, where it is quickly ruined by frequent moisture, spills, and stains and is generally unsanitary. When choosing carpet for a home for sale, consider the color and style carefully. The color should be neutral and appropriate for the house, and the weave and material should be suitable for versatile use. Carpet can be a good option for rental properties because it can be professionally cleaned, but it's also prone to permanent damage from stains and pets. 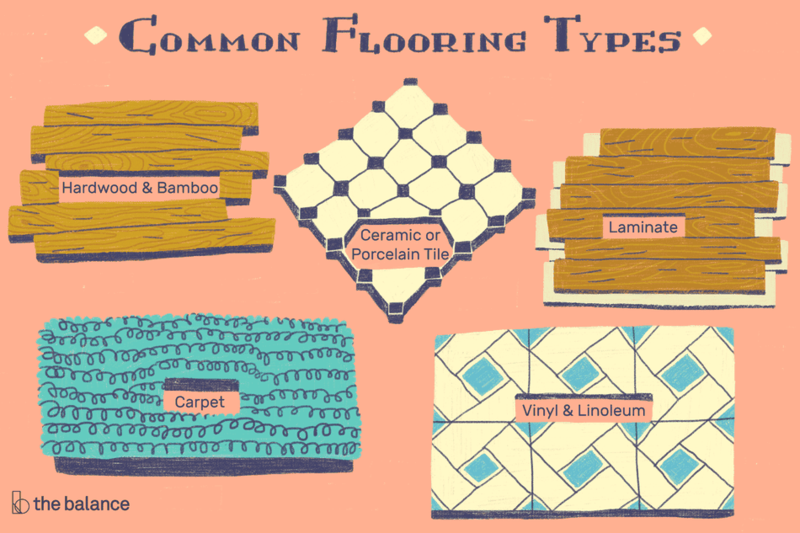 Vinyl and linoleum are different materials but are similar types of "resilient" flooring. Both come in easy-to-install tiles, planks, and sheet forms. They are highly durable and moisture-resistant and come in a wide variety of colors and styles. Vinyl and linoleum are good options for hard-working and high-traffic areas, including kitchens, dining areas, mudrooms, laundry rooms, basements, and bathrooms. The main difference between vinyl and linoleum is their materials. Vinyl is plastic, usually PVC, acrylic, and similar polymers. Linoleum is made with natural materials, primarily jute, cork, and linseed oil. Vinyl generally offers more style options and a wider price and quality range, from very low-end to premium. Linoleum comes in vibrant colors and is mid- to high-end; there are no budget versions of linoleum. Because it's made with natural materials, linoleum can be an attractive alternative to vinyl for builders and buyers who prize environmentally friendly or natural products.